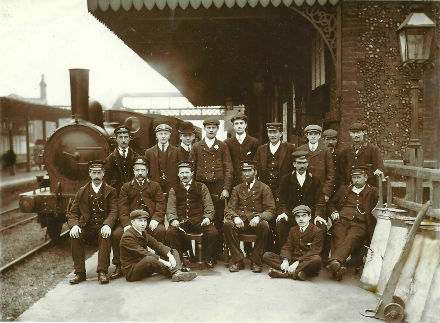 Wymondham Railway Station in 1906. There was a convivial atmosphere when the new season opened with a social evening at the Fairland Hall. The theme of the meeting was “My Favourite Photographs” and among several interesting displays was one by Sue Edes of her grandfather Captain Frederick George Pavey, who joined the Royal Horse Artillery around 1891. He was a gunner in the King’s Troop and saw service on the Ivory Coast during the Boer War. Jane Harvey’s photo of her many relatives from all over the world was taken at her 80th birthday celebration, while Bruce Blackney’s evocative one of him, suitably attired, at the Base Camp of Mount Everest must have brought back memories. Jim Cawte brought a scrapbook of the Wymondham Lions, many of the pictures highlighting their good works and charity fund-raisers like a sponsored cycle run. The Wymondham Lions were established in 1970 and the very next year they were promoting Expo 71, a grand carnival enjoyed by the townsfolk. Jim once displayed a model railway he owned in the Central Hall. Fascinating photos from the Town Archive, exhibited by Richard Fowle and Mary Garner, ranged from staff outside the post office in Market Street around 1900 to laying the sewers in Damgate in the early 1930s. Others were taken by legendary Wymondham photographer Henry Cushing some 120 years ago. Philip Yaxley’s collection featured pictures taken on the Regal Experience’s trips to Hollywood and others of Wymondham Railway Station in the early 1900s. Kevin Hurn, the chairman, thanked the exhibitors, Juliet Tregaron for arranging the refreshments and everyone who attended for making it an enjoyable evening. He mentioned it was important to spread the word about the society’s activities in an effort to attract new members.